Scioto County Courthouse security officials Eric Valentine, Denver Triggs and Craig McLaughlin are busy checking individuals as they enter the courthouse. Scioto County Commissioners met Thursday for their regularly scheduled meeting. Most notable items on the agenda included notification from the Ohio Department of Taxation for permissive sales tax for November 2018, and an ARC Application for Earl Thomas Conley Splash Pad Extension. Notification from the ODT was accepted, and according to commissioners the total of $826,652.75 is up $51,000 over last year. The application to the Appalachian Regional Commission was approved and will grant $250,000 towards the Splash Pad Expansion which will double the pad in size and include slides, in addition to creating a separate space for very young children. If the grant is received it will be combined with funds from ODNR for a total of $499,750 and those funds would be available between September and October of this year with ground to be broken early 2020. Pam Frowine from the Scioto County Dog Pound and Dan Palmer of Lawrence Scioto Solid Waste Management District were present to address Commissioners. Frowine informed Commissioners on ongoing issues regarding citizens failing to register for dog tags which directly funds the pound, while Palmer discussed the issue of tire dumping around the county. Palmer stated that he wishes to have a meeting with Portsmouth Police and the Scioto County Sheriff to discuss dumping, and says in the state of Ohio a certificate must be acquired for anyone hauling large amounts of tires and enforcing that law could prevent dumping. When asked about courthouse security, Commissioners stated that security personnel has established a positive presence within the building and that new security improvements are making a difference. “We hit a peak of 87 knives being detected in one day,” said Commissioner Bryan Davis. According to Commissioners, while security measures have been in place just 25 days the change is already creating a safer more secure environment. 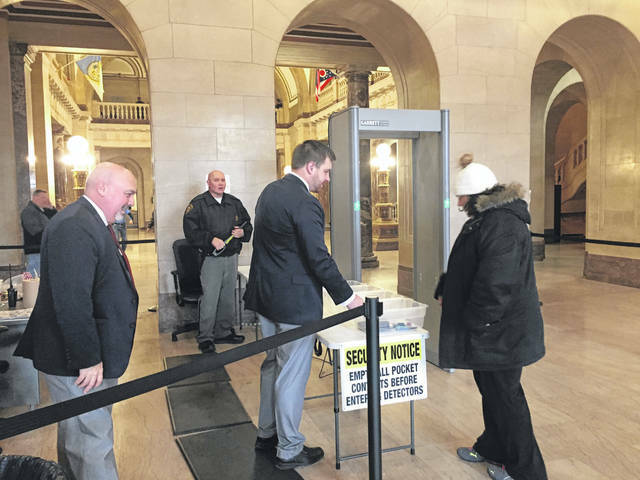 https://www.portsmouth-dailytimes.com/wp-content/uploads/sites/28/2019/01/web1_Security.jpgScioto County Courthouse security officials Eric Valentine, Denver Triggs and Craig McLaughlin are busy checking individuals as they enter the courthouse.